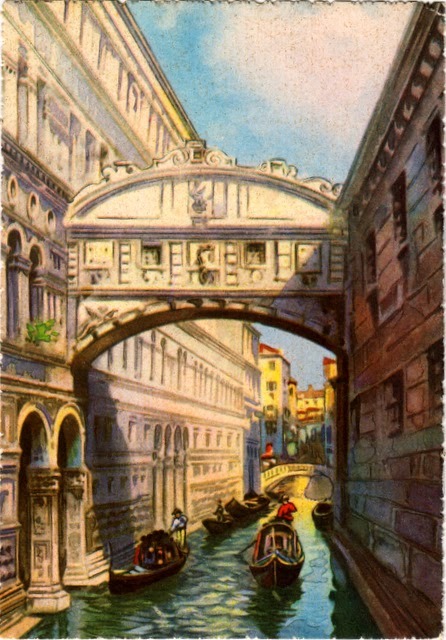 Postcard US-3064047 to India shows the Bridge of Sighs (Ponte dei Sospiri in Italian) in Venice, northern Italy. Designed by Antonio Contino and built of white limestone in 1600, it is an enclosed bridge with windows that have stone bars. Over the Rio di Palazzo, it connects the New Prison (Prigioni Nuove) to the interrogation rooms in the Doge's Palace. Legend says that the bridge's name was given by Lord Byron in the 1800s because the view from the Bridge of Sighs was the last view of Venice that convicted criminals saw before their long imprisonment. However, in reality, when the bridge was built, only small-time criminals were imprisoned in the cells under the palace roof. Also, there wasn't much to see from inside the bridge as those stone bars covered the windows. According to Wikipedia, another legend says that lovers will be granted eternal love and bliss if they kiss on a gondola at sunset under the bridge while the bells of St Mark's Campanile ring. The 1979 movie A Little Romance, featuring Laurence Olivier and Diane Lane, adopted this legend as its plot line. I bought this vintage card at a stamp show.